The Doctoral Student Union (DSU) Malmö was founded in the summer of 2012 as the second student union in Sweden that solely represents postgraduate students. It is open to all postgraduate students affiliated to Malmö University and one of its five faculties: Education and Society (LS), Culture and Society (KS), Health and Society (HS), Technology and Society (TS) and Odontology (OD). What does the DSU do? The DSU is involved in monitoring and improving postgraduate education at Malmö University by working towards increased transparency, having representatives within the university’s bodies at the central and faculty levels, pushing for improved communication and helping establish a bottom-up approach by promoting doctoral collegia throughout the faculties. It seeks to promote awareness of doctoral students’ rights and support when conflictual situations arise. The DSU believes an ongoing discussion that seeks to include all relevant parties at all faculties and at all levels is a healthy way to continue improving doctoral education at Malmö University. What’s the difference between the DSU and a trade union like ST or SULF? A doctoral candidate is both a student and a staff member within the university. While an union like ST and SULF looks at labor issues, the DSU looks at the educational aspects. Are doctoral students getting quality education that is also effective and efficient? Are the working relationships between supervisors and PhDs ok? Are there adequate resources for doctoral students to carry out their studies and research? Are there work environment issues affecting the studies of a PhD? The DSU’s body includes the board, doctoral collegia at the university’s faculties and doctoral collegia who attend the annual meeting. To promote a bottom-up approach and make sure all voices are heard, the faculties of LS, OD, HS and a joint KS-TS have doctoral collegium as student councils that meet at least once per semester. The issues raised at the collegia are reported to the DSU Board who can in turn address the issues at the central level. Each doctoral collegium including the chair is composed of PhD students at the faculty. The chair is the convener and is selected each year by DSU members of the faculties. To contact the current collegium chair at your faculty check the DSU contact page. Where does the DSU represents PhD students? The DSU Board represents doctoral students at the central level and collaborates with other student unions. The DSU is also composed of representatives at the faculty level who are involved in their respective local research committees and faculty boards. Representatives at other important university bodies also exist. You can find an overview of the DSU structure below. Forskningsnämnder / Boards of Research. 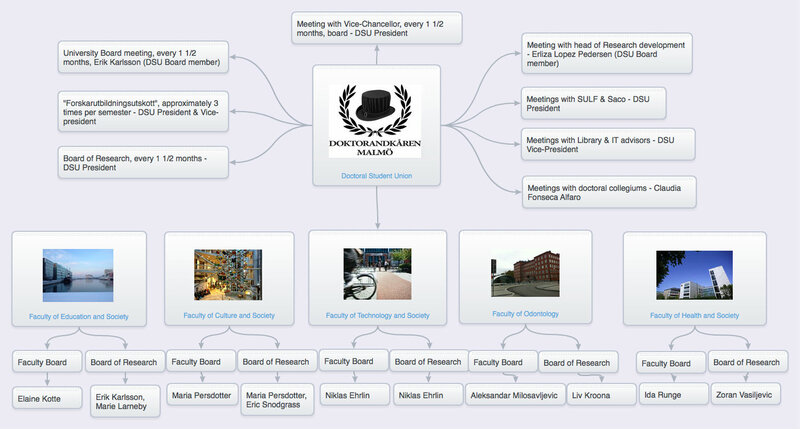 Each faculty has its own board of research with a different name.